Our vascular system can be broken down into 2 components, arterial and venous system. The arterial system is the system which moves blood away from the heart. The heart is the main muscle driving the blood away. The venous system is the system which takes the blood back to the heart. The main muscle in returning blood to the heart is calf. The venous system also has valves located within the veins to prevent backflow of blood. Overtime valves may become damaged, often presenting as spider veins (telangiectasia) or varicose veins. Veins become distended often appearing to pop out of the skin and may become painful. Risk factors for varicose veins, edema, spider veins, deep vein thrombosis or venous insufficiency include: hereditary, occupation (long periods of standing or sitting), frequent travel, pregnancy, etc. When venous insufficiency is present more fluid/blood accumulates in the ankle region. A patient with good venous health, standing or sitting has a venous pressure of approx. 90mmHg (millimetres of mercury). A patient with a compromised venous system will have a much higher pressure in this area. Clinically this presents with swelling. 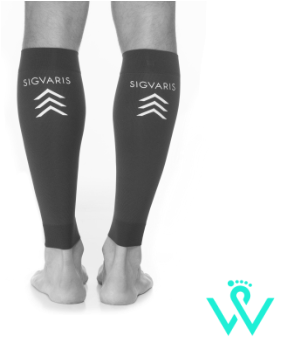 Compression stockings are graduated, with a high amount at the ankle region and lower amount as the stocking ascends the leg. This is why compression stockings come in ranges, eg: 15-20mmHg, 20-30mmHg, 30-40mmHg, or 40-50mmHg. The different grades of compression mean they are assisting with venous flow by that much.